This article is about the New Zealand Antarctic base. For the United States Antarctic base, see Amundsen–Scott South Pole Station. For the United States Air Force base, see Scott Air Force Base. The Scott Base is a New Zealand Antarctic research facility located at Pram Point on Ross Island near Mount Erebus in New Zealand's Ross Dependency territorial claim. The research facility was named in honour of Captain Robert Falcon Scott, RN, leader of two British expeditions to the Ross Sea area of Antarctica. The base was set up as support to field research and the centre for research into earth sciences, and now conducts research in many fields, operated by Antarctica New Zealand. Aerial photograph of Scott Base looking towards Observation Hill. By road, the base is 3 kilometres (1.9 mi) from the larger U.S. McMurdo Station. Aerial photograph of Scott Base, Ross Island, Antarctica. Scott Base was originally constructed in support of the UK inspired and privately managed Commonwealth Trans-Antarctic Expedition (TAE). The New Zealand government provided support for the TAE and also for the International Geophysical Year (IGY) project of 1957, five of whose members were attached to the Expedition. In February 1956, 10 months before the TAE and IGY parties were due to head to the Antarctic, Frank Ponder, an architect at the NZ Ministry of Works, was given the task of designing the base. Ponder's design consisted of six main buildings and three smaller scientific labs. The main buildings were to be placed at least 7 metres apart because of fire risk but were linked to one another by a covered way of galvanised iron. Three New Zealand observers who were also given the task of selecting the site for a base went to McMurdo Sound with the United States "Operation Deep Freeze I" in the summer of 1955. After evaluating possible sites, a location near Butter Point was chosen. This was later changed to Pram Point as it provided better access for offloading supplies from the Expedition ship HMNZS Endeavour and also allowed for the operation of the critical RNZAF Antarctic Flight on a nearby ice runway. The base looks out over what is now known as Haskell Strait. Scott Base passed over to NZ Government ownership via the Department of Scientific and Industrial Research (DSIR), on 5 March 1958, at the conclusion of the TAE. During the IGY the United States facility at Hut Point did not operate as a scientific base. It was the New Zealand expedition’s responsibility to furnish the important scientific data (auroral, ionospheric, seismic, etc. ), linking the McMurdo area research activities with those of the United States Pole Station and the joint United States-New Zealand station at Cape Hallett, Victoria Land. In 1958, following completion of the TAE and IGY, New Zealand made the decision to continue to operate Scott Base for scientific research, much of which depends upon the continuity of recorded data over a period of years. In order to maintain operations, a base rebuilding programme began in 1976. As of 2008, the only original building is the TAE 'A' mess hut, which contains material recording New Zealand's involvement in Antarctica since 1957. 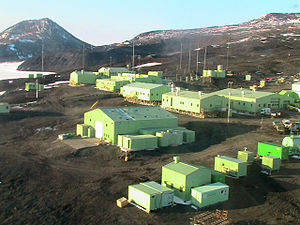 In 2005 the two-story high Hillary Field Centre was commissioned, increasing the floor area of Scott Base by 1800 square metres and providing work areas to support field parties as well as additional office space. The building was officially opened by then-Foreign Minister Phil Goff and Sir Edmund Hillary. From 1957 until 1986, dogs played a part in base operations. Initially they were an essential means of transport, but with better technology their importance dwindled until they were removed in line with environmental treaties. Scientific diving operations began in 1985. Between 1985 and 2006, a total of 1,296 had been logged. The A Hut of Scott Base is the only existing Commonwealth Trans-Antarctic Expedition (1956–1957) building in Antarctica. It has been designated a Historic Site or Monument (HSM 75), following a proposal by New Zealand to the Antarctic Treaty Consultative Meeting. The base is made up of a collection of Chelsea Cucumber green buildings which are linked by all-weather corridors. These buildings can accommodate 85 people over summer, with a "skeleton staff" of between 10 and 14 people remaining over the winter. Like nearby McMurdo Station, Scott Base is connected to the global telephone network via a Satellite Earth Station operated by Spark New Zealand, located approximately 3 kilometres (1.9 mi) away at Arrival Heights. Spark NZ also provide phone services to McMurdo for calls to New Zealand as well as to the Italian Programme at Terra Nova Bay. McMurdo Station has an independent communications infrastructure located at Black Island and linked to Ross Island via microwave. 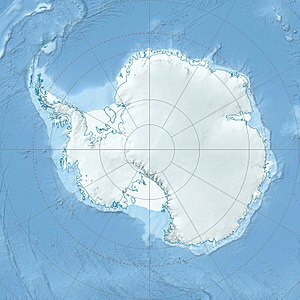 Scott Base is today operated by Antarctica New Zealand. Three Enercon E-33 wind turbines (330 kilowatts (440 hp) each) were deployed in 2009 to power Scott Base and USA's McMurdo, reducing diesel consumption by 11% or 463,000 litres (102,000 imp gal; 122,000 US gal) per year. The base has fairly typical weather conditions for coastal Antarctica, with minimum temperatures around −45 °C (−49 °F) and summer maximum only occasionally above freezing point. It is exposed to the full strength of southerly blizzards, although overall it is less windy than McMurdo Station. The maximum wind velocities experienced have been gusts up to 185 kilometres per hour (115 mph) with steady velocities under blizzard conditions of 95–115 kilometres per hour (59–71 mph). The highest recorded temperature was 6.8 °C (44.2 °F), the coolest −57 °C (−71 °F) and the mean temperature −19.6 °C (−3.3 °F). ^ a b "Scott Base". Antarctica New Zealand. New Zealand Government. 2016. Retrieved 11 July 2016. ^ Mercer, Steve (2000). "Antarctic lake diving with the semi-closed rebreather". In: Hallock and French (eds). Diving for Science...2000. Proceedings of the 20th Annual Scientific Diving Symposium, American Academy of Underwater Sciences. St Pete Beach, Florida. Retrieved 8 June 2013. ^ Pollock, Neal W (2007). "Scientific diving in Antarctica: history and current practice". Diving and Hyperbaric Medicine. 37: 204–11. Retrieved 8 June 2013. ^ "List of Historic Sites and Monuments approved by the ATCM (2012)" (PDF). Antarctic Treaty Secretariat. 2012. Retrieved 6 January 2014. ^ "Ross Island Wind Energy". Antarctica New Zealand. New Zealand Government. 2016. Retrieved 28 September 2015. ^ "New Zealand Wind Energy Association". Wind Energy. Archived from the original on 17 November 2013. Retrieved 6 November 2013. ^ Mackintosh, Lesley (2013). "How cold is the Antarctic?". NIWA. Retrieved 11 July 2016.